One of the most treasured colors in the plant world is red. Fortunately, nature gives us an abundance of plants that produce red dyes. 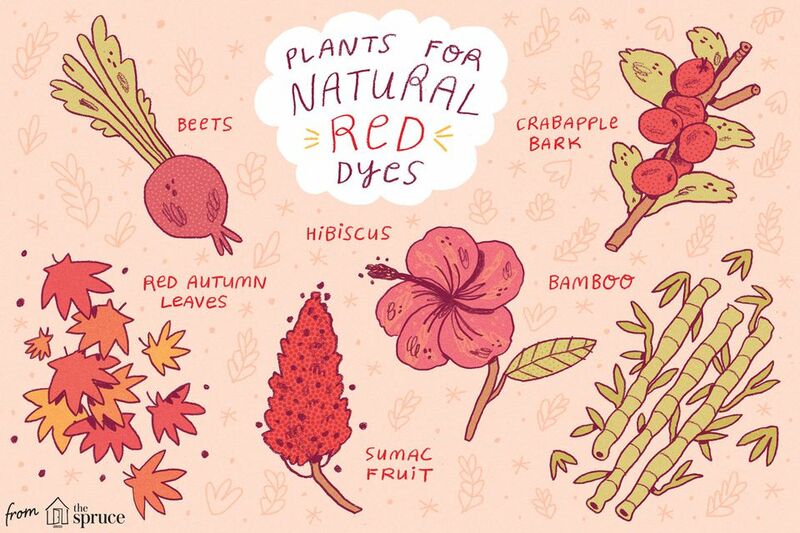 Learn how to create natural red dyes from plants and then use it to dye fibers and fabrics for your home, clothing, and craft projects. Gather red autumn leaves at their peak to create a dye bath that will produce a reddish-brown color. Simply place the leaves in a large pot and cover with water. Bring to a boil and allow to steep for several hours. Strain out solids. The dye will set well by adding salt to the rinse water. Bamboo is a member of the true grass family. Native to Asia, bamboos are some of the fastest growing plants in the world. Today they are farmed for building materials, fabric manufacturing, food products, and many other uses. There are many cultivated varieties that are grown in gardens around the world. When boiled with water, bamboo shoots produce a turkey red dye. Bedstraw, also known as Gallium Rubiaceae, is a perennial found in temperate zones throughout North and South America. Records of bedstraw dye are found from Anglo-Saxon times in England. To achieve a red dye, the roots must be boiled with water. The beet, Beta vulgaris, is a plant best known in its numerous cultivated varieties including the common garden beet. The color of garden beetroot is due to a variety of betalain pigments. The composition of different betalain pigments can vary, producing beetroots which are yellow or other colors in addition to the familiar deep red. Beetroot cells are quite unstable and will 'leak' when cut or heated. Removing the skin when boiling will help release more of the dye. To achieve a lovely red dye, select rich red beets and boil with water. Brazilwood, Caesalpinia echinata, is a timber tree native to Brazil and South America. The wood of this tree has a deep red hue which can be used to create a dye bath when boiled in water. The trees are now endangered and the trade of brazilwood is likely to be banned in the immediate future. Groups are working to replant the trees due to their highly prized wood for violin bows. Canadian hemlock, Tsuga canadensis, also known as eastern hemlock with a range from northeastern Minnesota eastward through southern Quebec to Nova Scotia, and south into the Appalachian Mountains to northern Georgia and Alabama. The bark of the Canadian hemlock is scaly and deeply fissured and produces a lovely reddish- brown dye bath when boiled with water. Chokecherry trees, Prunus virginiana, are native to North America and are found everywhere except the deep South. It is a small tree and produces fruit that ranges in color from bright red to dark purple. To create a brilliant red dye, select the red berries to boil with water. Crabapple trees, Malus, can be found in most temperate areas around the world. There are wild species and many, many cultivated varieties. The fruit can range from green to yellow to dark red. It is the bark, however, that can produce a red-orange dye bath when boiled with water. Elderberry, Sambucus, is a small tree or shrub found in temperate and subtropical areas around the world. The ripe elderberries can be used to make wine, cordials, and to dye fabric. While the berries are quite dark, you will find that ripe elderberries produce a lovely lavender dye when the juice is extracted. Select the unripened berries, still red with the skins, to boil with water, to create a red dye bath. Hibiscus is a flowering plant that is part of the mallow family. It is found in tropical areas and can be grown as a potted plant on patios during warm weather. Hibiscus flowers are used to make teas and to season foods. They are also used to create food coloring. You can make a nice reddish-purple dye by using the dark red and purple fresh or dried flowers and boiling them in water. Madder, Rubia, is a perennial scrambling or climbing herb found in temperate areas around the world. It is a cousin to bedstraw and the plants are often confused. Madder roots have been used for centuries to create a red dye known as rose madder or Turkey red. Boil the roots with water to create the dye bath. Portulaca, Portulacaceae, is a flowering plant of about 40-100 species found in the tropics and warm temperate regions. The plants are also called Moss Roses. Colors range from magenta, red, scarlet, orange to yellow. Use the flowers, dried and crushed with a vinegar or salt mordant, to create a dye bath with boiling water. 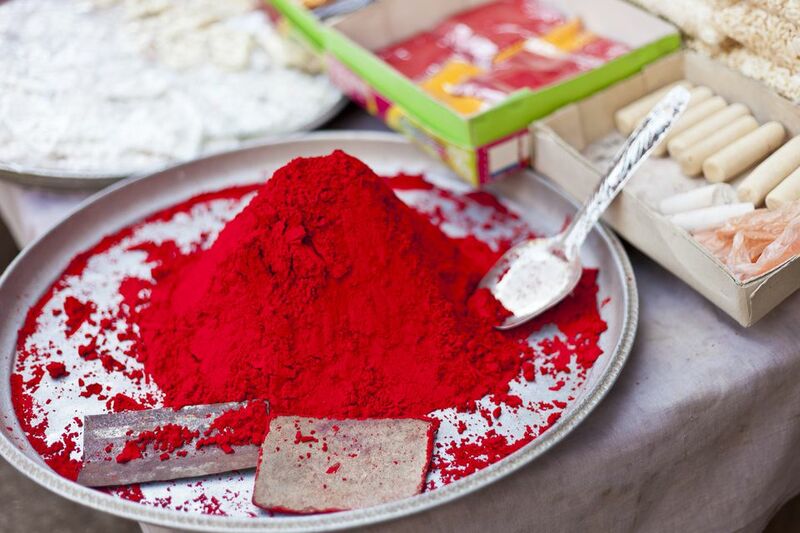 Use the brightest red flowers you can find to give the best red dyes. You can mix flower colors to achieve different shades of red. The rose hip is the fruit of the rose plant. They are usually red-to-orange, but range from dark purple to black and ripen in late summer. Rose hips can be used to produce tea, jellies or alcoholic beverages. To create a red dye bath, gather the reddest hips and boil with water. If you have no roses, dried rose hips are available for purchase. St. John's Wort, Hypericum perforatum, is now known as an over-the-counter treatment for mild depression. But for many years the whole plant of the common St. John's Wort, which can be found in almost every country, was gathered to create red dye. It is a perennial plant with extensive, creeping rhizomes. Its stems are erect and the leaves are yellow-green. The flowers have five petals and are bright yellow with conspicuous black dots. The flowers appear between late spring and early to mid-summer. The whole plant must be soaked in isopropyl alcohol (rubbing alcohol) to create a red dye bath. Sumac, Rhus, grows in subtropical and temperate regions throughout the world, especially in Africa and North America. They propagate easily and can become a nuisance shrub or small tree. Almost every part of the common sumac plant can be used to create dye. It is the leaves that will produce a tan or very light brown dye. Leather tanned with sumac is flexible, light in weight, and light in color. One type of leather made with sumac tannins is Morocco leather. It is the ripened fruit that will produce a light red dye bath when boiled with water. The sycamore tree, Platanus occidentalis, is native to North America. It is easily recognizable from other trees by its mottled exfoliating bark, which flakes off in great irregular masses, leaving the surface greenish-white, gray, and brown. It is that reddish brown bark that can create a red dye bath when boiled with water.